Yesterday, Jack posted about Adrian Beltre’s amazing year. I must admit that I was not aware just how amazing he has been, as Betlre’s wOBA of 0.396 puts him in the top ten in all of MLB. I wanted to see what was behind this offensive explosion from a guy who was a well-below-average offensive player last year (0.305 wOBA). Beltre has never been much of a walker, and this year is no different, so his increased success is mainly based on his balls in play. 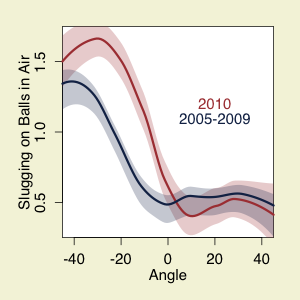 Looking at his splits by ball in play type, the biggest increase in performance has been on his fly balls. 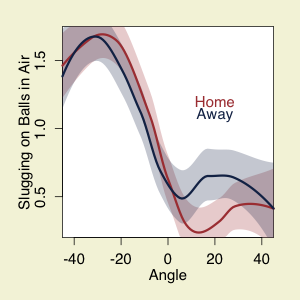 To delve deeper into this better performance I plotted Beltre’s slugging on balls hit in the air by the angle he hit them into the field (with -45 the third-base line, 0 the line between home and second base, and 45 the first-base line). The curves estimate his slugging with standard errors indicated and the data are split by 2010 and 2005-2009 (the years covered by the GameDay hit information). Beltre is a typical right-handed batter, getting most of his power to left field, his pull field. But in 2010 he has gotten even more power to left, starting at about center and going almost all the way to the third-base line. Beltre gets almost half a base more per ball in the air in 2010 compared to 2005-2009. To right field there is no real difference. So Beltre has done pretty much the same at Fenway and away to left, and a little better when away to right. Beltre has undoubtedly benefited from playing away from Safeco, but it looks like a big chunk of his success is just that he is pounding ball the a lot farther — with the help of the Green Monster or not. We hoped you liked reading Adrian Beltre’s Fly Balls by Dave Allen! It’s all in the knee-drop move. Good one, I just don’t understand why he doesn’t get on his knee from the start, he seems to hit for more power that way. Would be interesting to compare his homers he hits w/ his knee down with his normal homers. Avg times he gets rubbed on the head by Vmart, etc. He only drops to the knee on offspeed stuff.